I updated an older app “Barwert” to using bs4 controls instead of jqm. Everything seemed OK. The web app, deployed to my server, ran with the new design. So I prepared for building - updating - the native app with PGB. I included the new folders with new icons and splash. When I started to build the native app AppStudio stopped with the message that there was a malformed config.xml. I went to my account with PG. PG did not show an error, rebuilt the app and I could download it. It is the several years old app again. Even AppStudio finally showed a native app for download. It is the old one. Indeed the PG build log showed that PGB used old files such as icons and modernizr etc. which are no more available in the new folders and properties of the updated project with bs4 controls. I did reset the PG token and inserted the new one to PG property. The next build try showed the error message that I hopefully can attach. The AppStudio log has errors since I installed 7.2.1.0. I tried a lot of things, such as clearing cache in Chrome and deleting the PG build number in properties. Any idea what has gone wrong? 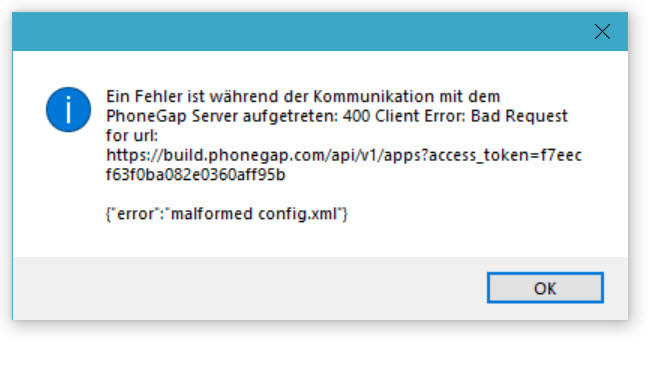 Did you delete the app from PhoneGap Build as well? There is no app „Barwert2016” any more. I reinstalled 7.2.1.1, saved Barwert2016 as BarwertCV and renamed properties. I got the same error. I noticed that AppStudio still sends with apparently the old token, not the reset and new token I copied into Werkzeuge/Phonegap. The new token has a lot more characters. 2019-02-04 23:07:15,714 - JFormat - ERROR - TOOLBOX/PROJECT BUG! FIX ME! 2019-02-04 23:07:17,655 - JFormat - ERROR - TOOLBOX/PROJECT BUG! FIX ME! 2019-02-04 23:07:20,832 - JFormat - ERROR - TOOLBOX/PROJECT BUG! FIX ME! 2019-02-04 23:08:11,257 - JFormat - ERROR - TOOLBOX/PROJECT BUG! FIX ME! 2019-02-04 23:11:04,211 - JFormat - ERROR - TOOLBOX/PROJECT BUG! FIX ME! 2019-02-04 23:11:18,976 - JFormat - ERROR - TOOLBOX/PROJECT BUG! FIX ME! 2019-02-04 23:11:40,082 - JFormat - ERROR - TOOLBOX/PROJECT BUG! FIX ME! 2019-02-04 23:12:04,868 - root - ERROR - An exception has occurred! 2019-02-04 23:13:10,871 - JFormat - ERROR - TOOLBOX/PROJECT BUG! FIX ME! 2019-02-04 23:19:52,410 - JFormat - ERROR - TOOLBOX/PROJECT BUG! FIX ME! 2019-02-04 23:20:40,178 - root - ERROR - An exception has occurred! These error messages are just the result of the original problem. It’s looking for the status of a nonexistent app on PGB. The errors came already while the app still was with phonegap and I think I deleted the old project only when I was looking for a reason that AS and PG always rebuilt the old version. BTW: On Feb 2 I got two other updated apps built by AS and PG and others on the days before. I think it was always the same procedure. Of course there were a lot of things to be done after using the converter. I might have done something different by accident. But I cannot find any relevant difference in these updated projects. I even tried to build a new apk with new names, titles etc. but with the same content. Thanks. Solved. App was built again with PGB. b) Restored from backup disk the old project from year 2016. Copied and pasted the BuildId into the newer project. Renamed title and ID from .Barwert2016 to Barwert. c) Re: malformed? - Inserted in config.xml the Android Version-Code to a higher number than it could have been before, e.g. 7.7.4, and used the same numbers for version. Android platform target to 26 and min to 16 and removed the this enclosing <…platform>.